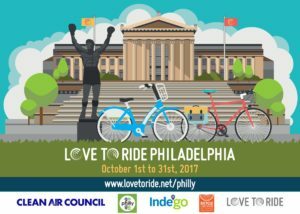 For the month of October, Clean Air Council and GoPhillyGo will be celebrating bicycling across Philadelphia with the Love to Ride (LTR) Challenge. Whether you are a regular cyclist or brand new, LTR aims to get more people riding bikes by giving out lots of prizes and creating some fun and friendly competition between workplaces. LTR is not just about who can ride the most miles, but who can encourage the most people to give bicycling a try. So, start a workplace team, log your trips, encourage your friends and coworkers, and climb the leaderboards for a chance to win prizes, like a brand new bike. Anyone who lives or works in the Philadelphia area. Businesses compete against each other to see who can get the most staff to ride a bike and log their trips between October 1st and 31st. A simple points model is used to allow workplaces to compete with each other across their size category (see the points system here). The points system has been carefully selected to ensure a fair and exciting competition, and to strongly encourage workplaces to engage new riders if they want to climb the leaderboard and secure victory! Participants don’t have to ride their bikes to work to participate. Riding only 10 minutes on a neighborhood street counts as participation. Of course, if you log more miles and more trips you’ll earn more points (and have a shot at some special individual prizes), but the fastest way to earn more points is to encourage more people to get on a bike and ride! Click here to learn why your organization should participate. Sign up! Find your workplace team or, if your organization is not registered, you can be the first. It’s free! Ride a bike anywhere, anytime for at least 10 minutes between between October 1st and 31st, 2017. Record your ride here. Or, download the ride report app to automatically record your rides. You can also automatically record your rides by linking an app you currently use, like Strava and MapMyRide. Tell your friends and coworkers about the LTR Challenge. 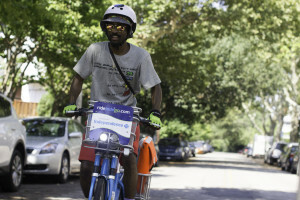 If you have any questions, please reach out to Nick Rogers, Love to Ride Philadelphia Challenge Manager, at nrogers@cleanair.org.